She is a "traditional magician" and is usually seen with a book. She seemed indifferent to the students who approached her in class as first but eventually warmed up to Kaori and Tadashi and grew to treasure them due to their friendly spirit. Her secret identity is that of an apostle of Index, the largest magical organization within the world of 11eyes and 3days. Her real name given by Index is "Ursula of the Bookshelf". 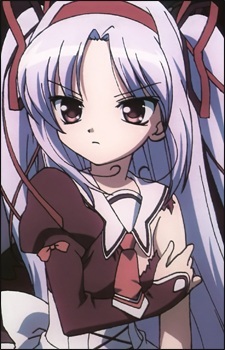 She transfers to Kakeru's school to keep an eye on the place and report its situation to Index. Her assignment was due to the sudden disappearance of the last warden. She is extremely powerful and is candidate for the next 14 saints, the highest officials within Index. However, her family line is cursed to born without eye balls. In her case, the curse is even worse and she couldn't even move a finger. Her current body is a magical artifact with her brain and nervous system transplant into and allow her to hold 5000 magical books within. The body operates by absorbing magical energy. She is a classmate of Yuka and Kakeru.